I've lived in the greater Binghamton area for more than 15 years now, and while this area is lousy with top notch Italian food, holds its own with a breadth of Asian eateries, and is now rounding out its better nouveau American options, great Mexican restaurants can never quite maintain a toe hold here. Los Tapatios used to be really decent, until the Mexican family running it had to leave and new owners took over and promptly excised all flavor from the menu. Margaritas, out on Upper Front St., similarly once was terrific and then new ownership killed it. It's not even open now. Las Chicas Taqueria, in Owego, has fab food, but I never quite feel the decadence and relaxation of the Mexican restaurant experience I want there, due to the counter service and a la carte style of the menu. It feels more like fast food than a full service restaurant, which is fine for lunch, but doesn't quite suit my fancy for dinner. So when I heard Garage Taco Bar was opening in Binghamton, I was justifiably pumped. I figured, with Binghamton's latest restaurant renaissance, this would be the taco joint I've been waiting for. Big Hungry Melinda and I ventured there last week to give it a taste. The indoor/outdoor space is very cool and very different from the norm around these parts. It made me think of Austin or Portland - hip and casual. What I liked less than the decor was the entire service set-up. 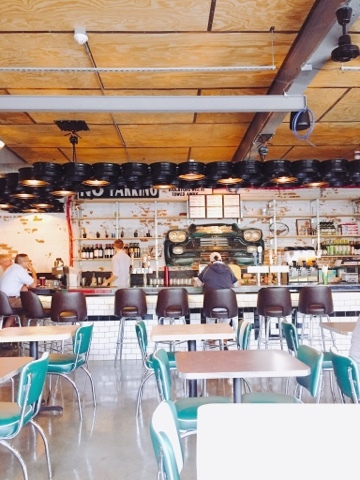 At Garage, you order at the counter, pick up your own food at the counter, and get your own drinks from the bar. So there's no table service, which would be fine if the bar wasn't actually slower than the kitchen, meaning that a lady is left to wonder if she should leave the bartender who's in process on her drinks to grab her food, or get a table first and the risk leaving her purse unattended there while she runs the errand of fetching drinks? The food gets cold while you're waiting at the bar...the hassle is complicated and frankly, more logistics than I want wrapped into a night out. Call me old, but I like to be served at my table by a waitress. The cafeteria style deal might work if not for the full bar, but with the time differences between how quickly food is prepared here and how long it takes to get drinks, I have heard from more than one person that it is decidedly not working. I concur. But it remains to be seen if Garage's owners will tinker with the service mode here; meantime, let's talk about the food, shall we? We started with chips and guacamole, but never got to try them until all our food had come due to the hold-up at the bar, which kind of stole this starter's thunder. That said, we liked the guac. It was impeccably fresh, dancing with subtle citrus juice, and a little bit of garlic. Not a lot of texture to it - this was a smooth avocado mash. The chips were fresh and a little too plentiful. 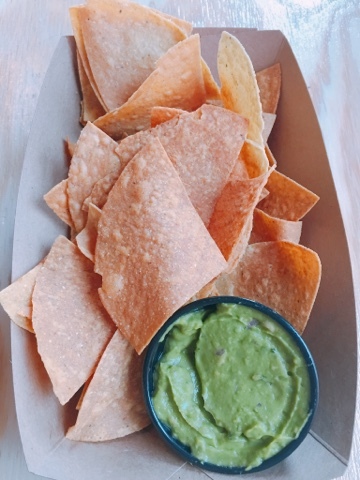 We ran out of guac long before we got through the tortilla chips, which is another bit of fine-tuning easily addressable by a new resto. At the bar, Melinda ordered margaritas and asked what kind of tequila they had. We're fancy tequila folks and were interested in upgrading to a silver variety. The barkeep gave her a quizzical look and told her they only stock one tequila, a gold bottle she'd never heard of - not even Cuervo or Patron. They have a frozen marg machine that debuted last week, but just the one kind of tequila - doesn't hat seem odd for a taco "bar?" One way to afford to hire some wait staff, guys, is to encourage people to do shots at your bar. Some upscale tequilas would help that endeavor. 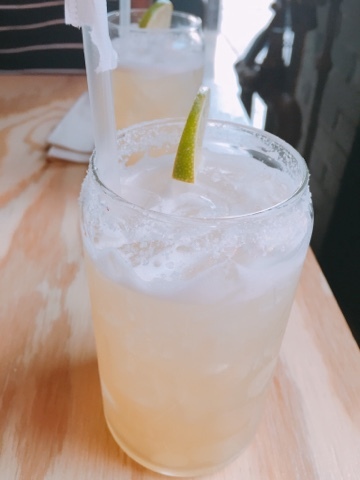 In any event, our margaritas were icy, which is good, but very lacking in any flavor other than sour mix. Hard pass. The Tex-Mex joint of my dreams not only has some options where tequila is concerned, but also some signature house margaritas incorporating fresh fruits and maybe even some chiles. The choice between this and a generic frozen marg is, for me, not really a choice. I tried the carnitas and carne asado tacos for my main. I liked them much better than the margarita, but both proteins were lacking in vivid flavors. The carnitas did have a good kick of cumin in its pineapple salsa, but the cheese was utterly flavorless, and whereas a traditional pork carnitas tacos would be dressed with raw onion and lime juice, this communicated more muted flavors. The pork was tender and plentiful, and the two small corn tortillas were right on. Tasty, but not tremendous. The carne asada, or diced steak, was more bland, begging for spice. Here's something weird: there was no spice to be had. There is no salsa bar or bottles of hot sauce on the tables here; no way to kick up the tacos. Have you ever been in a Mexican restaurant with no hot sauce and no salsa? Me neither. 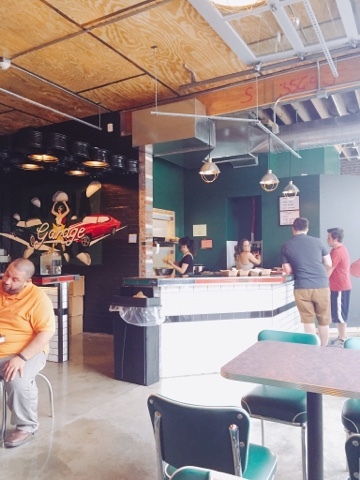 If Garage Taco Bar is trying something new, it may be a bit lost on me. And with no waitress stopping by to ask us if we needed anything, I would have had to again haul my cookies up to the front to ask for such condiments. 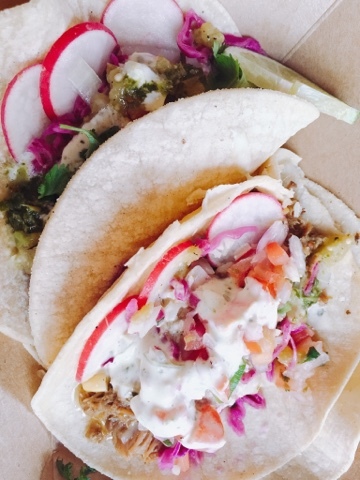 I should mention that the crunchy radishes on the tacos did add texture and that slight sharp edge, which was lovely. The ingredients in both were well executed, just lacking in a little verve, for me. My kingdom for some Cholula! I chose black beans and rice as my sides. The rice was well seasoned and well cooked, flavorful and easy to shovel in. The black beans, however, were the dullest ones I've ever tasted. It's not hard to kick up black beans. A scoop of pico de gallo and a packet of Goya Sazon, plus some onion and garlic are all a batch needs to be savory and deeply flavored. These just tasted like plain boiled beans with zero pizazz. Another pass for me. Melinda ordered the slaw as a side - one more pass. It wasn't slaw so much as just quick pickled cabbage, which is a lovely topping for a fish taco, and maybe would be good on the carnitas taco too, but is under no condition a suitable dish to stand on its own as a side. It was sugar, vinegar, and cabbage. Blah. I realize we were remiss in not trying the queso and plantains. I promise to go back and put them on my list, but I think I'll wait awhile. Honestly, I just really prefer to eat at a full service restaurant, or at least a place where I order at the counter and then the food is brought to the table. The lack of condiments seems, to me, like something the management may figure out in due time, as is the odd discord between food service and bar service here. I'm sorry if I sound lazy, all not wanting to get up and go ask for condiments, but honestly, isn't some of that what we pay for when we dine out? Just a bit of service? I give Garage Taco Bar at temporary five on the BHS scale, but I'm really hoping they work out the kinks, because I'm rooting for this place to step up and become the Mexican food paradise we so sorely need here. 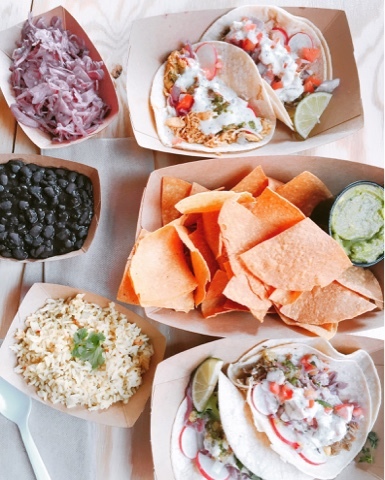 With just a few improvements, I'd really love to gorge myself on awesome, inspired tacos and tequila, and then give Garage Taco Bar an eight or a nine. My personality is big; my hunger is bigger! Alas,no more B H S taco at Gabes any more either.